Freeman's Art + Design sale on 20th March, features three masters of Modern. First, it's the spiritual works of George Nakashima. Nakashima’s creations are both a triumph of precision and attention to design. The Conoid chair, which is supported on two legs alone, with long feet and angled stiles supporting a cantilevered plank seat, proves that Nakashima's skills knew no end. During WWII the Nakashimas were interned at a relocation camp in Idaho. Whilst there, Nakashima met Gentaro Hikogawa, a carpenter who worked with Nakashima to design and build furniture for their moderate home at the camp. Nakashima learnt how to use traditional Japanese hand tools and construction techniques that did not involve screws or nails. Nakashima’s furniture is defined by his use of exposed dovetails and butterfly joints, which showcases the structural intelligence of his pieces. As well as the Japanese influence, it is evident his design is inspired by American shaker design, an aesthetic adored for its simplicity. Nakashima's passion for wood conveys how that he had a deep connection to trees and forests. His works are almost living being, Nakashima’s philosophy was influenced by Sri Aurobindo, an Indian philosopher and poet with whom he studied while in Pondicherry, India overseeing the design and construction of the Golconde Dormitory for the Sri Aurobindo Ashram. Nakashima’s furniture respects the tree it was formerly part of, creating something lasting which preserves the beauty of the tree in the forest. Moving away from the simplistic, to the equally beautiful yet in-your-face designs of Piero Fornasetti. Fornasetti's classical architecture influence and his fanciful graphics wowed audience of the 1950's, and continue to do so today. Italian design flourished during the Post-war period and the lines between art, craft and design were blurred. Piero's objects are surreal, and appear to have their own personality. Among Fornasetti’s most successful and desirable designs are his collaborations with Gio Ponti, another significant designer and architect of the 20th century. 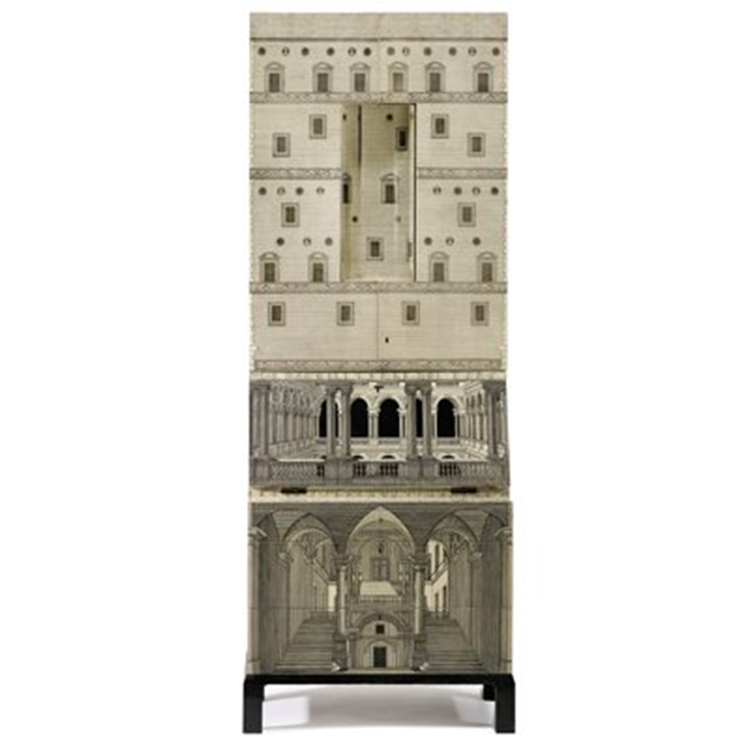 On sale at Freeman's is the Ponti and Fornasetti “Architecture” bureau and desk dating to 1951. The prototype for the bureau had splayed and tapered wood legs and a concave pediment. It was exhibited at the IX Milan Triennale. One of two existing examples is in the permanent collection of the Victoria and Albert Museum in London. Fornasetti altered the pediment and base for production beginning in 1953. Finally, to the colourful geometric works of Frank Stella. Frank Stella was first introduced to the print medium in 1967 by master printer Ken Tyler. Tyler had established his own atelier, Gemini G.E.L. two years prior and was searching for prominent artists to join his workshop. Stella had already made his way into the art world for his minimalist, geometric paintings, significant for their departure from the dominant Abstract Expressionist style of the time. To begin, Stella was not so excited to work with print, but he was soon persuaded when Tyler gave him a lithographic tusche disguised as a marker with which he could draw directly on the lithographic stone. Stella executed his prints in series, with each one consisting of a variety of solutions to a specific formal problem. The Newfoundland Series (1971) was based on a series of paintings under the same name created a just years earlier. Stella modified the prints, creating a “pyschologically distancing” effect that is quite different from the immediacy of the paintings on which they were based. He framed the squared and double-squared interlacing protractors with white margins and screenprinted an outline around his segmented shapes, thus intensifying the powerful tension between each color, highlighting the movement of each shape and fortifying the geometric form. As Stella was always concerned with the strength of the image, he added flourescent inks and gloss-varnish in order to enhance the color and vary the texture, therefore increasing the visual impact of the surface as a whole. The sale will include Frank Stella's River of Ponds II from his Newfoundland Series. The Art + Design sale will take place on 20th March. Check out the full catalogue on Barnebys here.